"Being hove-to in a long gale is the most boring way of being terrified I know." There are plenty of times in life where things get crazy-busy and we need a break, or the environment surrounding us gets stormy and we simply need a way to ride it out. Times like these are when I wish there was something in our daily life analogous to heaving-to aboard a sailboat. For those that do not know, heaving-to is a sailing tactic that allows the sailboat to slow forward progress almost completely while requiring no input from the crew once the sails and rudder are set. I like to think of heaving-to as a way to anchor in open water. Heaving-to can be useful for taking a break form sailing and having a meal down below or fixing equipment that can't be tended to under normal sailing circumstances. It can also be used as part of a man overboard maneuver or as a way to ride out a storm, both of which require special considerations (see below). We practice heaving-to at least a couple of times per season and I recommend you do the same. That way you'll know what to do if you need the tactic in an emergency and you'll how your boat behaves. The concept of heaving-to is simple: Set your sails and fix your rudder so they each are in balance and cancel out the effect of the others. In actuality, every boat heaves-to differently and to varying degrees of success. In general, long and full keels heave-to much better than deep, skinny fin keels and flat bottomed hulls. The process is usually simplest on a sloop rig and can get more tedious as you add masts (ketch, yawl, etc.) and sails (cutter rig, etc.). But this is a time honored act of seamanship that even the squared-rigged tall ships of yore were able to accomplish with a trained crew and suitable conditions. Since I've only ever hove-to aboard sloops, I'll only be writing about those particular experiences, but I'm eager to hear techniques for use on other rigs, so leave a comment or drop me an email if you have something to share about your experiences. 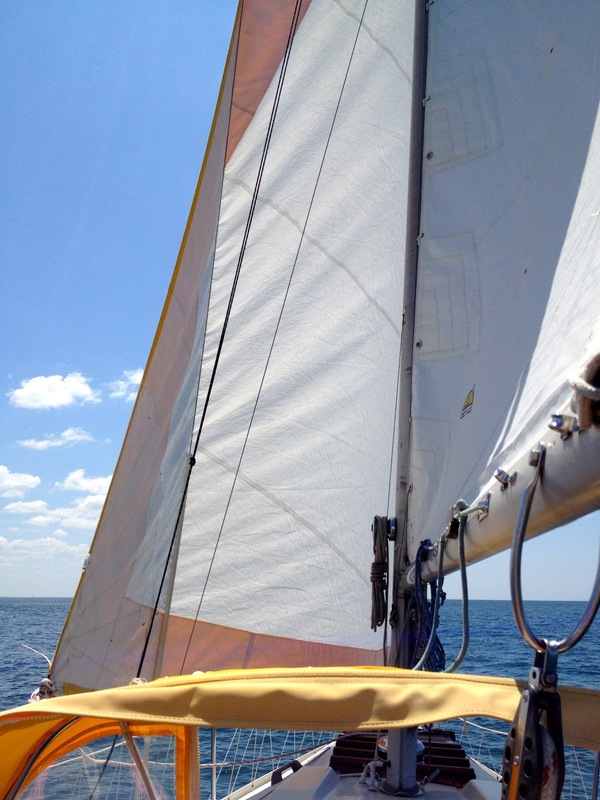 1) Shorten the genoa by roller reefing (this prevents the sail from catching/tearing on the spreaders when it is backwinded). 2) Tighten the genoa sheet. 4) Tack through the wind without releasing the genoa sheet. 5) Lash the tiller to leeward. That's it. If conditions are right, Island Bound remains hove-to and maintenance free so we can relax, eat a meal, or tend to any number of tasks like swatting the flies that gather when the boat is still! However, it is important to keep in mind that while the boat will make very little if any forward progress, it will slip to leeward every so slightly (maybe 1-2 knots), so we always make sure we've got seaway to leeward before heaving-to. We also maintain a watch to make sure there are no approaching hazards. To get underway, we simply unlash the tiller and ease the genoa sheet so the sail moves to leeward and we're sailing again. The above method is what we use when conditions are calm. If the wind and seas are up and we determine it's safe to heave-to, we insert a step between 1 and 2 above. In this case, we physically heave the genoa to windward using the windward sheet. If the wind is particularly strong, we can shadow the genoa with the mainsail so that it's easier to bring the genoa to windward. This step saves a potential violent tack with a backwinded foresail. Some sailors consider heaving-to as a storm tactic for riding out severe conditions while at sea. Some have done so for several days a time while remaining relatively safe down in the cabin below. Heaving-to in storm conditions requires extra precaution, extra seaway, and heavy storm sails. Normal weight cruising sails (like ours) would be quickly shredded if we chose to heave-to in storm conditions because while the boat's movement is slowed significantly, the forces acting on the sails are just as strong as if we were sailing. If a sailboat is rigged for storms, heaving-to can be an effective and safe tactic for waiting for weather to pass. For example, consider the infamous and tragic 1979 Fastnet race where 25 of the 306 boats in the race were either sunk or disabled and only 86 finished the race. Fifteen sailors died during this event. There were 26 boats that chose to heave-to during the horrendous Force 10 conditions (wind 55-63mph, waves 29-41 ft.) and none were capsized or suffered serious damage. Other boats in the race that did capsize or were severely damaged chose to race onward, lay ahull, or run under bare poles. We've only used heaving-to as a means of taking a break during a long sail, but I like knowing we've got another tool in our bag of skills if an emergency were to arise (such as someone falling overboard). Practicing sailing techniques such as heaving-to, reefing, MOB drills, and rigging a boom preventer helps us stay in touch with the unique personalities of both our boat and fellow crew members. If only we were so disciplined and well-practiced in all aspects of our life! skygazer says "Thank you, good discussion!" Love reading your blog. My question is, Why don't you end up in irons with rudder pushed to leeward? Brian - The tiller is lashed to leeward, which keeps the rudder in a position that tries to turn the bow of the boat to windward (see diagram above). This action is counter-acted by the back-winded headsail, which tries to push the bow off to leeward. Rudder pushing the boat to windward + headsail pushing the boat to leeward = a net effect of almost no movement at all, thus heaving-to. Give it a try on your own boat and you'll get a better feel for it and start to understand the impact of each factor for your particular boat. Thanks for your comment! The other beneficial thing about lashing the tiller to leeward is that if the boat makes sternway (as it will do if it gets up into irons) the rudder will turn the stern up towards the wind, causing the bow to fall off.